I recently made several hanging dish towels for my sister. 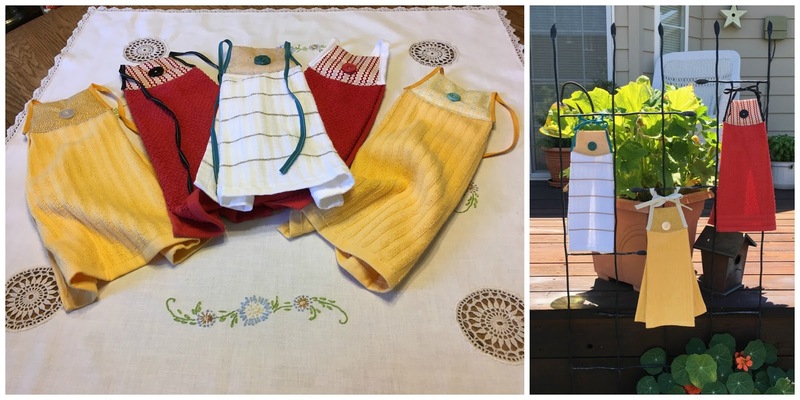 I have never thought about making these hanging dish towels since my oven does not have a handle to hang them on, but if it did I would hang this adorable towel. My sister was here for the week helping my mom out and asked if we could make these together. She brought a sample towel that she bought several years ago which we used as a pattern. Below is her new towel and the sample towel. We went through my fat quarter stash and found lots of cute fabric for the top section. We used bias tape for the string and a few buttons for decoration. I think they turned out really cute and now she is stocked with new towels! Below are a some of the towels we made. Here is the rest of them all in a pile! What a fun and easy project, I hope she brings a new project next time she visits.